Global consumption patterns and population growth are increasing food demand, requiring increased food production on top of gains already needed to address malnutrition. This challenges the achievement of food security goals, and is exacerbated by climate change. Advancing towards sustainable agriculture systems requires embracing the inextricable linkages between food security, poverty, and climate change and associated tradeoffs of investment pathways. Climate-smart agriculture (CSA) embodies the ambition to improve integration of climate change responsiveness into agriculture development planning. CSA is defined as “agriculture that sustainably increases productivity, enhances resilience (adaptation), reduces/removes GHGs (mitigation), and enhances achievement of national food security and development goals” (FAO, 2010). CSA includes both traditional techniques, such as mulching, intercropping, conservation agriculture, and pasture and manure management, and innovative practices, programs, and policies, such as improved crop varieties, better weather forecasting, and risk insurance. Widespread adoption of CSA can create sustainable landscapes and build momentum towards climate-smart food systems, but achieving this requires integration of CSA across levels from farmer fields to national and regional panning. Given the complexity of the CSA concept, the need to evaluate multiple tradeoffs, and for solutions to be context specific, decision-support frameworks are needed to facilitate the identification of portfolios of best-bet CSA options. The CGIAR Research Program on Climate Change, Agriculture and Food Security (CCAFS) and the International Center for Tropical Agriculture (CIAT) have taken on the challenge of developing a framework for prioritizing investment in CSA that is evidence-based, yet realistic in that it can move forward in the face of data and resource constraints. The process grounds prioritization in inclusive participatory processes integrating actors to ensure alignment with stakeholder criteria for prioritization and contextual realities. Flexibility is a key characteristic of the process to ensure users across sectors and levels can modify the process for their planning needs. 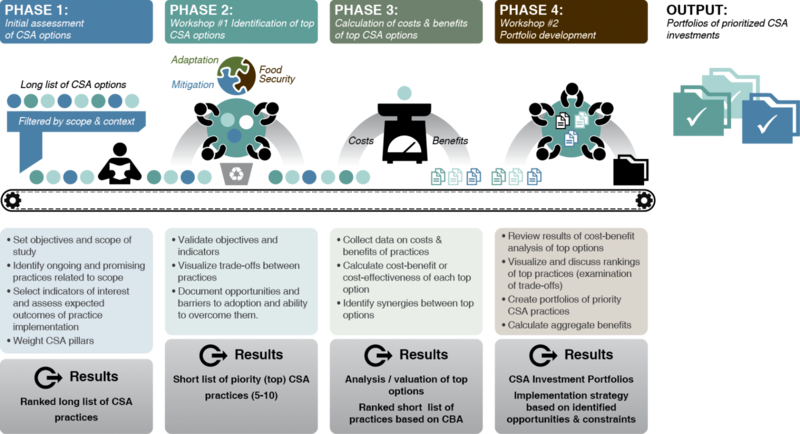 The prioritization framework uses a four phase approach to guide stakeholders through the process of filtering a long list of applicable CSA practices into portfolios of priority practices. The phases are additive, with each refining the previous outputs. The process generally takes between 4-8 months, and can be simplified and still provide valuable inputs into investment decision-making. The process begins by identifying the scope of the CSA investment in terms of geographic area, challenges to address, and desired outcomes practices should have for beneficiaries. A list of practices linked with the scope is created and assessed based on indicators of desired outcomes. The framework includes a list of suggested indicators for evaluating practices linked with the CSA goals (productivity, adaptation, and mitigation), such as yield, increased income, water use, emissions intensity, etc., and others can be added. Stakeholders are gathered to validate objectives and select top practices from the long list of options. The indicator analysis provides the base of discussions on tradeoffs between the achievement of the three goals of CSA, stakeholder desired outcomes, and barriers to adoption. Cost-benefit analyses are conducted on each of the practices in the short-list, prioritized in phase 2, to identify investment opportunities associated with various productive systems. Analyses are based on scientific literature, expert knowledge, and primary data as needed. Stakeholders are reunited to select CSA practices for inclusion in investment portfolios. Tradeoffs between the ranking of practices associated with the CSA goals, desired outcomes, and economic feasibility are visualized and discussed. Aggregate benefits from different portfolios along with synergies between practices are explored, and perceived constraints and barriers to adoption, along with ways to overcome them, are included in analyses of portfolios. Other tools and processes, such as crop modelling, participatory scenario development, and frameworks for evaluating sustainable land management, can be integrated with this approach. The CSA prioritization framework aims to provide a coherent process for increasing technical understanding of CSA options and directing climate change and agriculture investment to assist national and region planning. With transparency and participation at the heart of the process, local knowledge and scientific evidence unite to establish realistic pathways for increasing CSA adoption. Pilot studies are currently being conducted with national government actors in Guatemala and Mali, and four pilots are planned for 2015 in Asia and Africa. Informational manuals detailing the process, along with training materials, are available upon request. FAO. 2010. “Climate-Smart” Agriculture: Policies, Practices and Financing for Food Security, Adaptation and Mitigation. Rome: Food and Agriculture Organization (FAO).